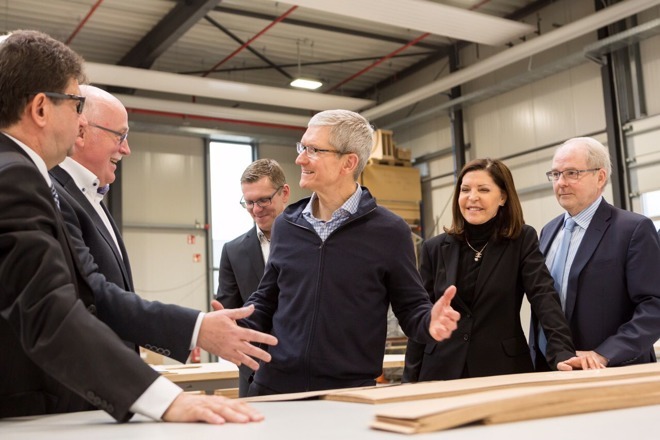 Apparently embarking on a broader European expedition, Apple CEO Tim Cook made his way to Germany on Tuesday, after having also visited a third retail store in France. The executive's first German stop was with an Apple supplier, Dula, in the city of Vreden, according to a Twitter post. Rather than working on electronics components, Dula crafts fittings and furniture used in Apple's stores. Cook took a tour of the Dula factory, but as is common for the CEO, didn't say whether he was engaged in any business talks. 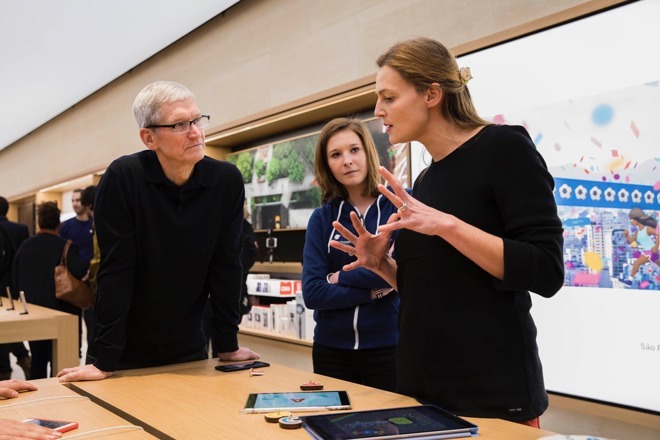 Before arriving in Germany, Cook stopped by the MarchÈ Saint-Germain Apple store in Paris, where he met with some young iOS developers. The outlet is still extremely new, having only launched on Dec. 3. Separately Cook mentioned meeting with "JR," an artist with various international projects on his resume, such as photographs of athletes installed on scaffolds around Rio de Janeiro for last year's Summer Olympics. Cook has been in Europe since the weekend, visiting stores in Paris and Marseilles, as well as people like fashion designer Julien FourniÈ. He also sat down for a Le Figaro interview, teasing the likelihood of another Parisian store on the Champs-...lysÈes. The CEO is due to be in Scotland on Wednesday to receive an honorary doctorate from the University of Glasgow.